The rolling countryside of Cordoba province is crossed by the Rio Guadalquivir, on who's banks the city of Cordoba stands, and the Sierra Morena further to the north, dividing the province into two fairly distinct areas. To the south of the Sierra Morena, Cordoba province shows much of the characteristics of elsewhere in Andalucia, undulating topography, olive trees, vineyards, and white washed villages. To the north, within the Sierra Morena, the character is more akin to the regions of Extremadura and Castilla La Manch to the north, with mining villages of granite built houses. It is also sparsely populated with few villages between the pine and oak forested hills. The city of Cordoba has its origins in Roman times, when the Rio Guadalquivir would have been used for transporting olive oil and other products back to Rome. One of the features of the city today is the impressive many arched Roman bridge across the river. The city of Cordoba later became the Moorish capital of El Andalus, hence the building of the huge Mosque, the Mezquita. After the reconquest, the Mosque, which is an important tourist attraction today, was preserved by the Christians, who built a cathedral within it. The city is also famous for its flower decorated courtyards, a tourist attraction, particularly in May when a competition is held for the best. 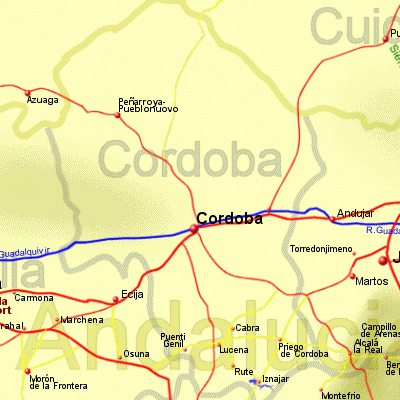 Cordoba can be accessed by High Speed Train, the journey from Madrid taking less than 2, from Sevilla, less than 3/4 hour, and approximately one hour from Malaga.